Lately I have been doing a lot of experimenting with pickup wiring options. As I have been doing this, it occurred to me that one could literally spend months trying out all the pickup coil configurations with all the different switches available to us nowadays. 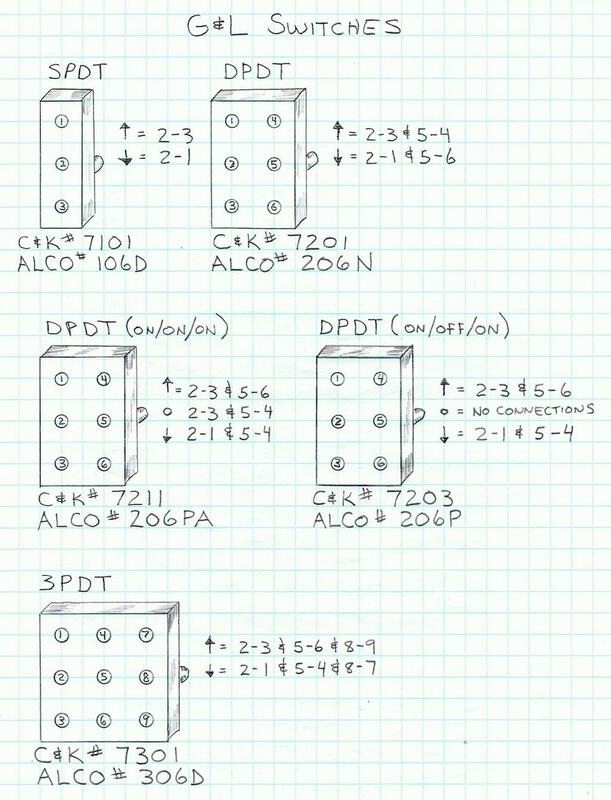 As I was digging through some of my old drawing of bass wiring diagrams, I came across this drawing I made of all the switches G&L was using on their guitars and basses during the late 80s and early 90s. The drawing I made was from sometime in the early 90s and all of the switches that I had in this collection were manufactured by ALCO. These switches were a very light green color and had their part number on one side and their switching option, as well as voltage/current ratings, on the other side. There are several companies that make small toggle switches for doing things like pickup selection, preamp mode, pickup coil configuration and what not. The two I like best are ALCO and C&K. As I said, there are others but I always use one of these two. I made a new drawing of the switch collection and put both the ALCO and the C&K part numbers on each switch. Also, I made a list of which contacts were made between which lug numbers in the various toggle positions. Please note: there are times when different switch manufacturers number their lugs in a different direction. I have numbered each lug on these switches shown here and the connection matrix is referring to those numbers. For example, let’s look at the DPDT (on/on/on) switch that has the ALCO part number of 206PA. All the switches are drawn as if you were looking at them from the back with the toggle facing away from you. If you were to flip the toggle upwards, you would have a connection between lugs 2 and 3 as well as from lugs 5 and 6. If you were to flip the toggle in the center position, you would have a connection between lugs 2 and 3 as well as lugs 5 and 4. If you were to flip the toggle downwards, you would have a connection between lugs 2 and 1 as well as lugs 5 and 4. 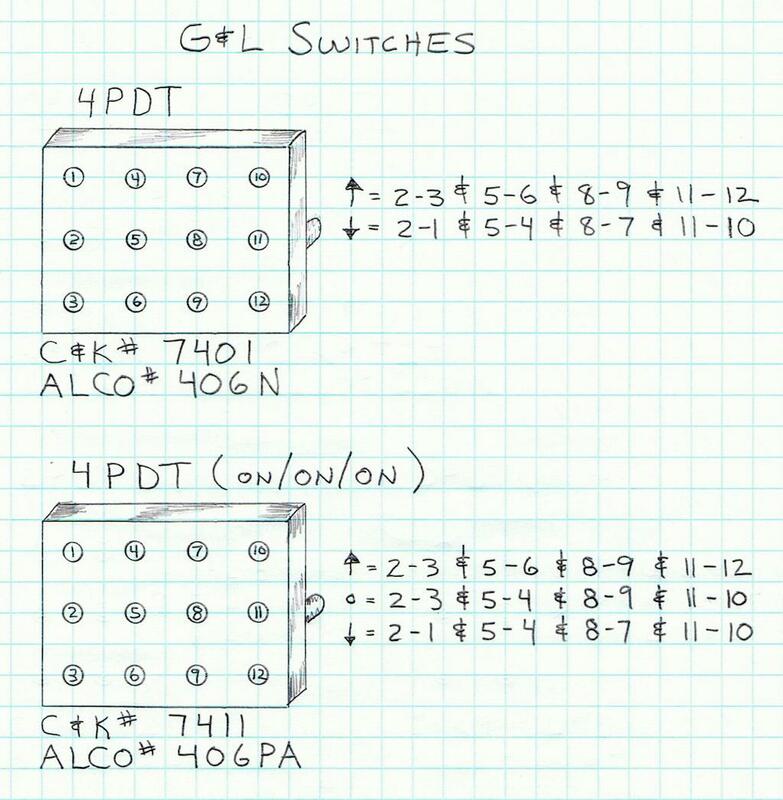 OK, so here’s the drawing I made showing the 7 different small toggle switches that G&L had in their line up back then. Most of these are still used today. The switches that you see most often today are the ALCO 206PA (C&K 7211), the ALCO 406N (C&K 7401) and the ALCO 406PA (C&K 7411). The ALCO 206PA is used for pickup selection on a two pickup instrument and for the Passive/Preamp/Preamp with treble boost option on the basses. The ALCO 406N is used for the Series/Parallel humbucker mode on the basses. The ALCO 406PA is used for the Series/Parallel/SC (often called the “K” wiring) pickup mode on the basses. So there you have it. I know there have already been many really good posts on the topic of switches so this is just another one to add to the collection. Hopefully I have explained this in a way that makes sense. Anyway, Enjoy!